With today’s technology there is no reason why many or most of our ancestor’s one of a kind collection of photos, causal candid or formal portraits, along with some non-replaceable documents, journals and records can not be ‘saved’ in a digital format. True, if something happens to the original wedding portrait of your great grandmother, it can be lost forever. Yet, if someone invested the time and effort to scan all the family documents and photographs, at least a digital image would exist. Those digital images can be shared easier and new print copies made from the digital. It just makes sense to get this done. You can always pay a professional to scan all the boxes of photos and documents, but you can also do it much easier nowadays yourself. Besides the standard scanning equipment available, another option are the more advanced hand scanning wanes on the market. With most scanning equipment you do need to be connected to a computer to operate it. Using the newer scanning wanes, you can sit at a table and not even have a computer in the household. I recently acquired the VuPoint Magic Wand Portable Scanner Wand, model 450, along with a dock. This is really portable, not like the heavier flatbed scanners. In size it is about 10.5 by 1.2. by 1.1 inches, weighing just over 6 ozs. Even the dock that the wand can fit into weights only 1.4 lbs. It works very well. The beauty of using a portable scanner is that it can go anywhere. With rechargeable batteries you are not limited to an electric outlet. 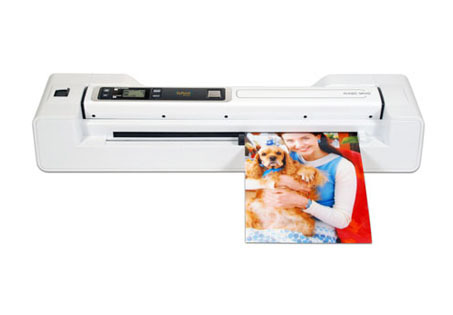 It can be operated so simply by pushing one button, running the wand lightly over the photo or paper and pushing the button again to stop the scan. You can place it on the dock, and just feed the photo or document and it carries it through,scanning it in about 4 seconds. The scanned image is stored on a micro-memory card, similar to the slightly larger ones used in digital cameras. The wane does not need to be hooked to a computer to scan and save those family archives. Yet, if you want the scanned items on your computer, simple enough to transfer all of them from the micro-memory card to any folder on the computer. If only using the micro-memory card, the images can go to a local photo shop or dealer such as Walmart and be printed or all placed on a DVD disc so others can have copies. The best part is that once you get use to handling the portable scanner either by hand or the dock, the whole scanning process goes very quickly. It can even scan pages in a notebook or bound book, something that can be quite difficult to do on a flatbed scanner. You could get 100 photos / documents scanned in about 1 to 2 hours. Just spend a little time each week and soon you will have all the family collection copied and saved. Another great use is to take it to the family ancestral hometown museum, courthouse, church, or while visiting relatives and scan anything relating to your ancestors take you would not be able to take home with you. It is so light and easy to carry, you could scan many things in a short period of time. There are several different brands of portable scanning wands (some with preview screens, without a dock) available at different price ranges, most under $150. So take the time and use the newest technology to preserve those precious letters, journals, documents, records, newspaper articles, books and photos of the family.